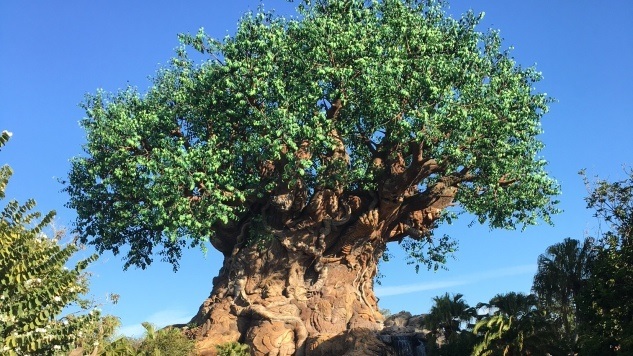 Animal Kingdom, Disney’s fourth theme park in Orlando, will be turning 20 early next year, and it’s never been better. The extravagant Pandora—The World of Avatar expansion opened in May, adding a veneer of alien splendor to what was already the most beautifully designed park at Walt Disney World. With Pandora’s two new attractions, and the new nighttime show Rivers of Light, you could easily spend an entire day at Animal Kingdom, marveling at animals in realistic habitats, taking in a number of live shows, and then braving some of the most exciting rides in Orlando. If you’re wondering what to prioritize during your day at the park, check out our list below, and plan those Fast Passes accordingly. Don’t stress too much about packing all this in, though: the park itself is so breath-taking that you’ll have an unforgettable time even if you don’t make it onto every ride and attraction. This isn’t just a typical song-and-dance routine based on a beloved animated feature. It’s an intricate puppet show that almost seamlessly unites human performers with puppetry in a retelling of the story of Finding Nemo. It’s a short show—just over a half-hour—but the complex puppets and fine score are both Broadway caliber. If you like musical theater or Finding Nemo, or just need a place to rest your feet and get out of the sun, this is a great option for your day at Animal Kingdom. If you want to get a close-up look at some animals from Africa, this walking trail is the thing for you. It features gorillas, hippos, meerkats, colobus monkeys, zebras and much more, including an aviary just packed full of birds. (You know you want to see that Hottentot teal.) Along with another walking trail we’ll be getting to in a moment, and one of the park’s major rides, this is the most Animal Kingdom feels like a traditional zoo. Dinosaur takes a great ride system that’ll be familiar to anybody who’s ridden Indiana Jones Adventure at Disneyland and Tokyo DisneySea and turns it into a trek back in time to explore the age of dinosaurs. It may not be as satisfying for adults as the Indiana Jones rides, due in part to an uninspired story featuring Phylicia Rashad and Wallace Langham, but the bounty of dinosaur Audio-Animatronics almost makes up for that. The lurching, speeding jeep and oversized robot lizards make this a ride that all ages can thrill along to. This is a fairly basic river rapids ride that ends too quickly. It fills a valuable niche at the park, though, and features some fine themed environments redolent of India, especially in the queue. It also has a commendable (and relatively subtle) message raising awareness about illegal logging. It might be lacking that polish expected from a Disney attraction, but it’s a must-ride on a hot Florida day. One of several new attractions on this list, Rivers of Light is an elaborate nighttime show that combines fire, water, color and music into a multisensory treat. Spread across 11 barges that glide around each other on a lagoon, Rivers of Light unites entertainment and technology in a way previously unseen from a theme park show. If you’re a fan of extravaganzas like Fantasmic and Paint the Night, you should probably make time for the impressive Rivers of Light. This walking trail features some of the most amazing environmental design of any Disney theme park. That’s already probably Animal Kingdom’s greatest attribute, but it reaches its peak with this Indian-themed locale, which features tigers, water buffalos, komodo dragons and more. These ruins have that heightened realism found in the best Disney themed environments; along with Tokyo DisneySea and the rest of Animal Kingdom’s Asia and Africa areas, this might be the high water mark for Disney design. It’s not a ride, so that might lessen its appeal to many, but if you go to theme parks to feel transported to another time and place, it’s hard to find anything that does that better than this. The lesser of two new rides in Pandora—The World of Avatar, the Na’vi River Journey is a too-short boat ride through a lusciously themed alien grotto. It ends with the most impressive Disney Audio-Animatronic yet, a large Na’vi shaman with graceful lifelike motion and an uncannily expressive face. It’s worth a ride simply for this state-of-the-art technology, but it’s a little too short and relies too much on projections, screens and repetitive scenery before the bravura finish. The park’s flagship ride when it opened, this rugged jeep ride through animal habitats lost its cloying story long ago and now focuses solely on the animals. That’s a smart choice, even if it makes it feel less like a ride in the traditional sense. Imagine Disney’s classic Jungle Cruise but on a large truck, with real animals and less corny jokes, and you’ll sort of know what to expect. The line-up of African animals includes rhinos, giraffes, zebras and more, making it a must-do for the zoo-lovers in your family. The verisimilitude of this savanna, combined with the detailed queue and tumult of the truck, might make you forget you’re in Florida and not Africa. This spiritual successor to Disneyland’s Matterhorn might be the most intense roller coaster at Walt Disney World, with the tallest peak and biggest drop, and a top speed just a hair slower than the Rock ‘n’ Roller Coaster Starring Aerosmith at Hollywood Studios. It’s not just a pulse-pounding coaster that switches back and forth between forward and backward motion, but another testament to design, with an intricately detailed recreation of Mount Everest, including another temple. The queue, which takes you through a travel agency with a Yeti Museum, feels natural and lived-in. And yes, you do have a face-to-face with the Yeti itself during the ride, although unfortunately the Yeti Audio-Animatronic hasn’t worked properly since shortly after the ride opened in 2006. That’s a long-running disappointment for Disney and theme park fans, but if you don’t know the Yeti is supposed to be moving when you encounter it near the ride’s end, you probably won’t guess that it’s broken. Either way it’s a gorgeous, exciting roller coaster, and the best one at Disney World. The main draw of the new Avatar expansion is worth the wait. This flying simulator is somewhat similar to Soarin’, but instead of sitting in a theater with only subtle movements, you’re sitting on a motorcycle-style contraption that has a much wider range of motion. When combined with the lifelike 3D CGI of the accompanying film, it feels like you’re riding on a banshee from the movie Avatar, with dramatic swoops and death-defying dives. Of the screen-based motion simulator rides at Disney World, this is both the most advanced and the most awe-inspiring. Waits can be extremely long right now, but what feels like Disney’s longest and most complicated queue should keep you entertained (or at least distracted) for hours. It winds from the bioluminescent outdoors of Pandora through a mountain cave into a Resources Development Administration science lab, with each area layered with more details and more extravagant theming. And if you’re worried that you won’t enjoy it without having seen or liked the movie, don’t: I’ve never seen Avatar, and was still blown away by this ride.